Your psychological issues and family matters will be your concern this month as foretold by the 2019 December Aquarius horoscope. The past will overshadow your plans for the future. You will have to let go of the past and focus on what the future holds for you. The Aquarius sun sign is selfish, but this month you will have to focus on others other than yourself. The people around you will help you overcome all the psychological issues that you are going through. They will encourage you to stop dwelling in the past. The people in your social circle will play a major role in helping you achieve your goals. You, therefore, have to improve on your social skills. Based on the forecast for 2019, this is a good month for love and relationships. The couples that are anticipating getting children will need to plan for Aquarius pregnancies. Married couples will have disagreements at the beginning of the month. But, as the month progresses love will be what they are talking about all through to the end. According to the December 2019 horoscope predictions, this month your family will help you in every way possible to ensure that your psychological health is in order. Family members will take it upon themselves to take you to therapy for you to let go of the past and focus on what the future holds for you. The Aquarius December 2019 horoscope predicts that your health will not be that great this month. Your energy levels are low and psychological issues are taking a toll on you. After the 23rd of this month, you will get some relief because you will start going for therapy and eating well to regain your physical and psychological health. According to the monthly horoscopes 2019, this month you will find it hard to cope with other people in the workplace. You will have to find a way to cooperate well with your workmates to achieve greatness. All those people who are looking for employment will only get work after the 23rd of the month when the stars will be in a kind mood. As per the zodiac signs predictions 2019, financial prosperity will be your portion this month. Profits will come your way from the investments that you have made in the past. You will also indulge in other businesses that will bring you money. Getting school fees this month will not be a challenge for you. The December 2019 Aquarius horoscope predictions reveal that friends and social contacts will be willing to finance your education up to university or college. 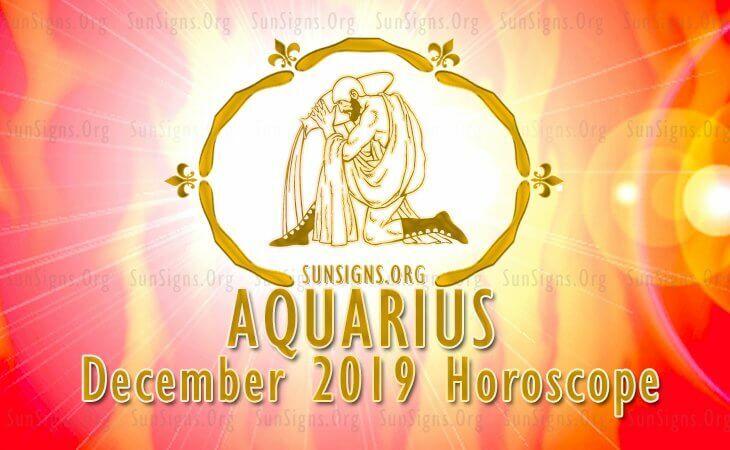 The 2019 December Aquarius horoscope predictions reveal that this month you will travel only with your family and friends. You will visit different places in the country. The time you spend with your family will greatly improve your health. You may also see Numerology 2019 Horoscope.